I have to admit, I will always identify with my inner festival-going love child and feel very at home in garb that effortlessly expresses this. So don’t hold the following sentiment against me when you see me rocking out in my bell bottom jeans and fringe accessories. With that said, the whole boho chic thing has become so played out. From Coachella to Bonaroo, I am getting very bored of seeing images of belly-baring starlets wearing body bling, distressed booties and exaggerated flowered headbands! Summer is approaching and there is no denying that when it comes to the fashion of the season, it is all about showing some skin to win. Whether it be a skirt with a high slit, a deep plunging neckline or a see-through overlay, displaying some flesh will instantly spring you into the now. This is a tricky notion to execute with grace, as you must create a delicate balance between skin and fabric. My advice is to choose only one area to flaunt and keep the rest of you under wraps. This is why I am all over the off-the-shoulder designs that are in stores now. There is nothing sexier than baring your décolletage and the tops of your shoulders with an otherwise conservative silhouette, while maintaining that ladylike poise. April 29th was #DenimDay, a campaign run for the past 16 years in Los Angeles and New York to encourage people to wear denim with a purpose: to support survivors of sexual assault and raise awareness (visit Denim Day for more info). Since this spring has been all about denim, I thought no better time than now to hit one of my favorite ways to wear denim: A great denim dress or a-line skirt. Oh how I love me a jumpsuit! From disco-inspired all-in-ones to fun flirty rompers, the jumpsuit has become a staple in my closet. 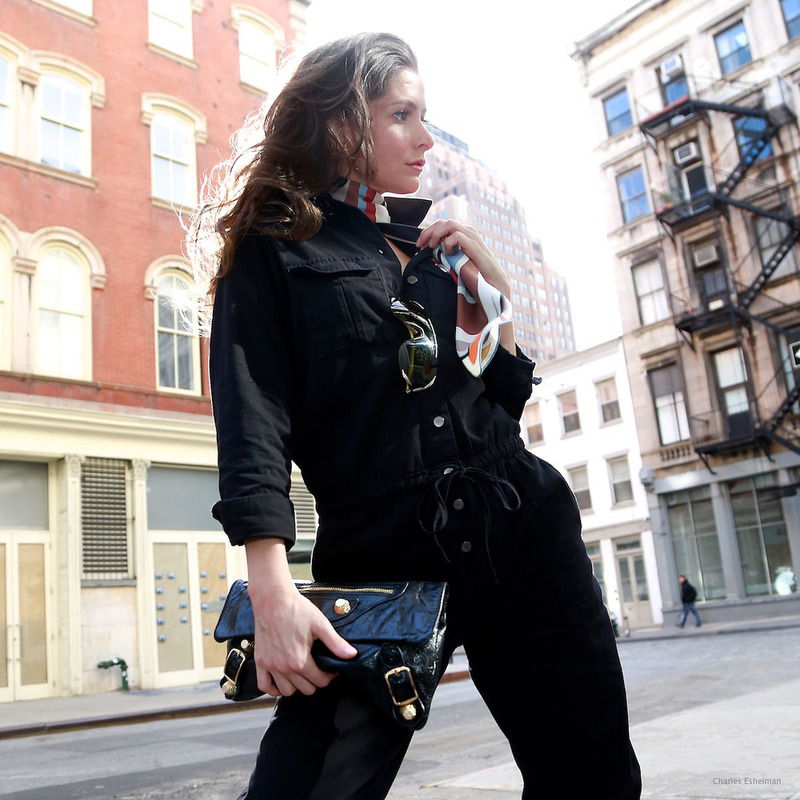 Whether I’m dressing for an evening cocktail party or picnic in Central Park as spring temperatures start rising here in NYC, this seasons’ designer darling, the utility jumpsuit, is one transitional piece that has me jumping out the door with ease, comfort and a little added street style cred. Spring has sprung and I’m ready to jump into it! Meryl Streep’s character in The Devil Wears Prada would say, “Florals? For spring? Groundbreaking;” but I have to admit, nothing reads spring more than florals. There is no denying that designers have embraced these patterns this season, too. From gowns to leather sneakers and everything in between, blossoms and florets are in full bloom. Hip hip hooray! Today marks the first day of spring, and with that, I have spring break on the brain! After such a long, cold, snowy winter, everyone could use a warm weather excursion. I think a nice shot of vitamin D could do all of our moods some good. But those dreams of sipping on a Mai tai with the sound of waves crashing in the background brings the reality that all those body parts covered up for months will suddenly be bare and out and about. Eek, talk about shell shock! Are you as bored as I am looking through your closet during this seemingly never-ending winter? I’ve been looking for ways to hit the streets feeling warm but still rocking a fresh ensemble. In an attempt to brighten up these cold, dark days, I decided to bypass my go-to black leather leggings and distressed denim and instead pull out my white jeans. I have to admit, I’ve never been much of a rule follower. I hope at this point we all know to just ignore the old adage about wearing white after Labor Day — that taboo is over!